The mature/adult counterpart to this site. It has Collector Cards (Comic Book Related (e.g., Animal Mystic, Razor), Fantasy (e.g, Boris, Rowena, Ken Barr, Jim Warren), Pin-up (e.g., Olivia, Joseph Lisner, Gil Elvgren, Sorayama, Steve Woron)) and Comics (e.g., Avatar, Brainstorm, Eros Comix). Want to know what cards are in a nonsports card set? Here's the best place to start! Get the latest news for comic books, action figures, toys, and tons more (includes Movie & TV news). A forum for/by comic readers to create an encyclopedia of information of all things related to comics. 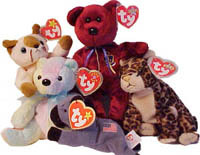 AboutBeanies offers the latest Ty Beanie Baby news, history and information. An "Easter Egg" is any amusing tidbit that creators hid in their creations. They could be in computer software, movies, music, art, books, or even your watch. A good starting point on the web to find out about many different topics... are those stories fact or fiction? Find out about those Internet related Urban Legends.